Hi All. 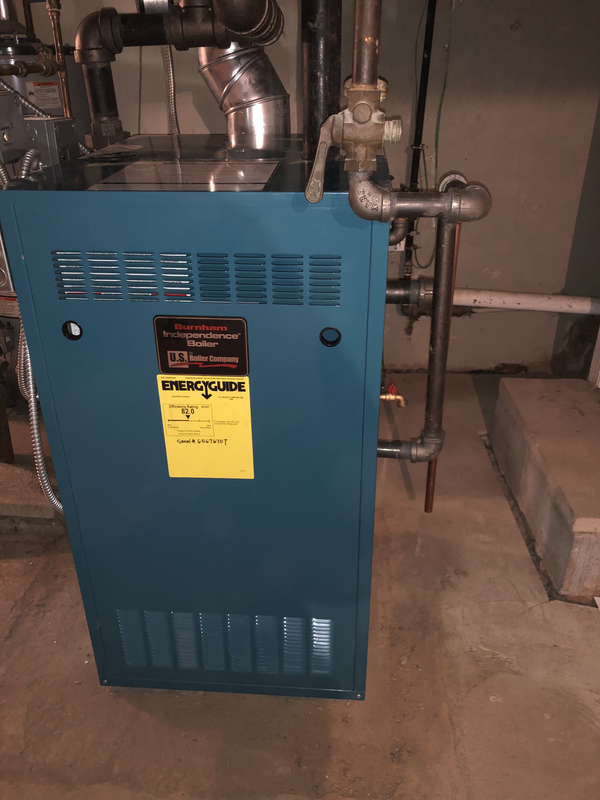 Three days ago Home Serve installed a new, bigger boiler. Since then all the radiators have been banging SOOOO LOUD and one radiator bangs, hisses, and eventually spits out water through the valve but does not get hot (barely warm). So three days without heat in my bedroom and a heating company (not the one that installed the boiler) comes out and refuses to do anything until Home Serve puts the correct pipe on the boiler. Prior to the boiler change my bedroom radiator was fine and the rest of the radiators work fine so I don’t think it’s the pipe. Before I go calling another company can anyone tell me if they have any ideas why it’s happening? Why on earth did they put in a bigger boiler? Unless you have added radiators, that was not a good move. 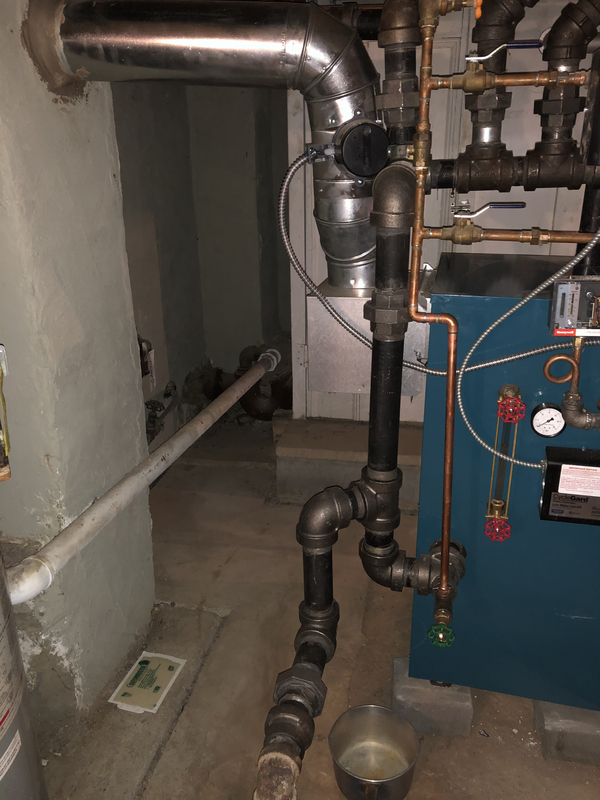 Chances are it is the piping around the boiler, plus most likely the pressure is too high, plus the boiler is oversized... all in all, a whole bunch of problems. Jamie an extension was put on those since the original boiler was installed. Fair enough -- but was the system working well with the old boiler? Did anyone actually measure the system to find out what EDR was actually required? 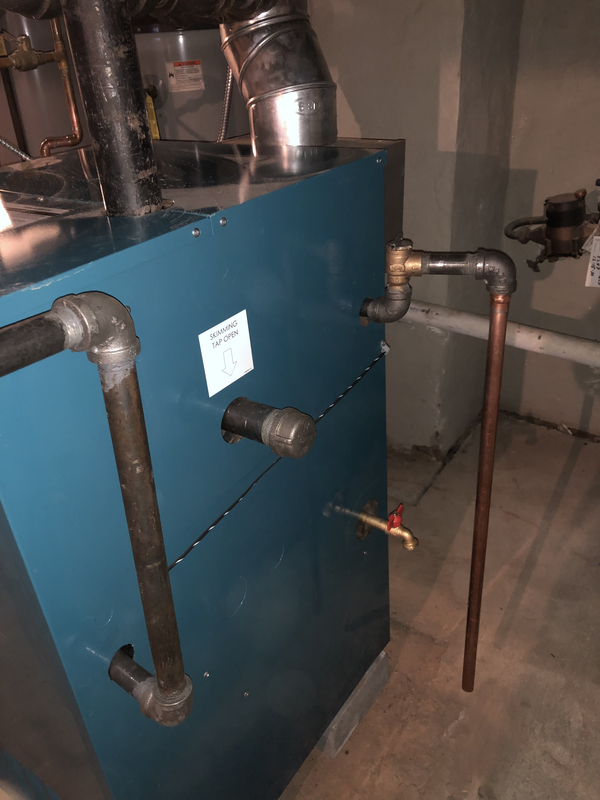 I'd venture that if the system was working with the old boiler -- radiators getting hot and all that -- that the old boiler was big enough, even with the addition. Jamie the Home Serve guy based it on the number of radiators in the house. I don't know if the header is large enough but all in all, the boiler installation looks pretty decent, certainly much better than most we see. The boiler probably just needs a good skimming, maybe several good skims. Burnhams seem especially sensitive to oils in the boiler water. I can see from the color of the water in the sight glass that it does need a skim and they even installed a skim port. I might add another comment. I see they installed a Cyclegard Low water cut-off on the boiler (probably came with the boiler package). Those LWCO's will shut the boiler down every few minutes to check the water level. It may be shutting the boiler down before steam can get the your bedroom radiator. Is your bedroom radiator at the end of one of those mains? Do you have good main vents on each of those mains? That could be an issue too. I don't know what contractor Home Service used but they seem to know steam better than most. Hopefully they put good main vents on the system, not that that would necessarily be part of a boiler replacement but well worth making sure you have them. I'm also a little concerned that it looks like they may have pulled the mains down a bit to tie into the risers out of the header. The mains, at least two of them seem to pitch down towards the header and one of them is even elbowed up to the main. I see no drips to the wet return. Do you get any water hammer? Maybe just the angle of your pictures (except for the main that is definitely elbowed up). It looks like there's no reduction in size of the equalizer. That can cause water to push up into the system. The header APPEARS to meet the MINIMUM requirements in the I/O instructions, but it would have been much better if they had done 2 risers off of the boiler and used a 3" header. As Fred said, better than most of the installs we see. Fred, what is water hammer. 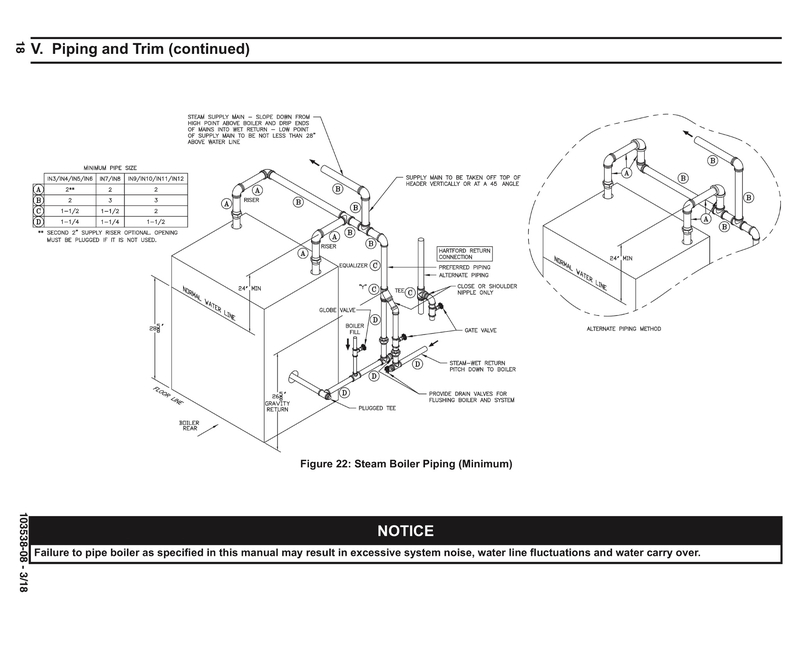 I'm not at @Fred , but water hammer (in the contest of steam heat) is the banging noise one hears when a slug of water -- condensate -- in the pipe which is being pushed along by the steam hits a sharp turn, such as a T or an elbow. It can be remarkably loud. It can also be hard to find the exact location, since the pipes transmit the sound well. It can also be hard to distinguish from expansion noises sometimes. 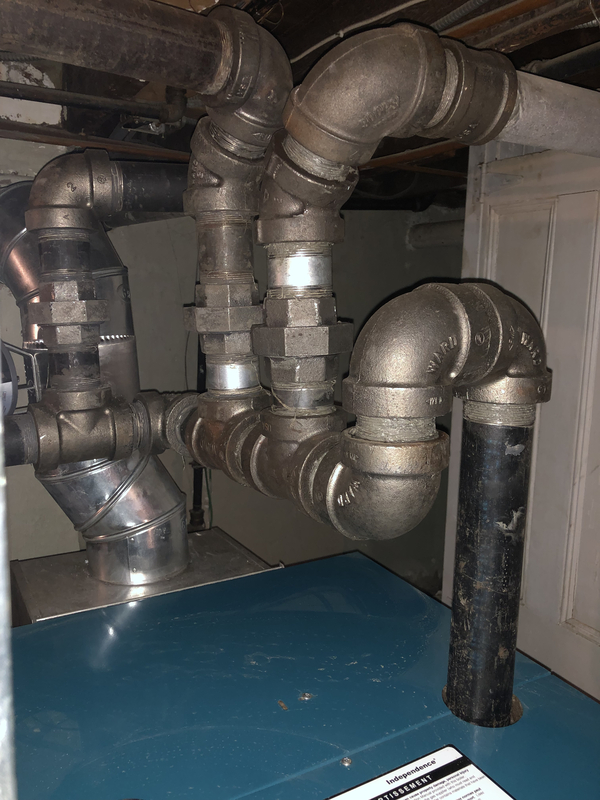 Expansion noises tend to have more of a ring to them, and also tend to be rather regular (though not always) while water hammer is usually louder and sounds -- as the name suggests -- more like someone hitting the pipe with a hammer. Thanks Jamie. The banging was very loud but not so much anymore. Home Serve came this morning and said they cannot do anything until I replace two valves. Can you show us the valves.....or did they say vents. Are they telling you to replace floor valves or the silver vent on the other side of the radiator? They may be faulty but before you replace them make sure your pressuretrol is set correctly. The one on the right should be set to cut out at no more than 1.5psi. High pressure will cause banging, hissing and water spitting out of the vents. They want me to replace the air vents. What I don’t get is the vent was working fine with the old boiler but I have to do what they say. Why can't they handle the replacement? > Thanks Jamie. The banging was very loud but not so much anymore. Home Serve came this morning and said they cannot do anything until I replace two valves. > Why can't they handle the replacement? Because Home Serve is strictly for maintenace of furnaces and boilers. That's pretty lame. Find a real service organization. Where are you located? That's extremely lame. Any service I do on any boiler includes making sure the heat emitters function properly. Home Serve is a service/maintenance company connected to National Grid which is our heating company. They only maintain furnaces and boilers. I’m so frustrated because last night my mother’s radiator stopped working as well. This is real nonsense. The boiler needs a good skim. Would they change the batteries in a T-stat for someone who is incapable of doing it themselves......not part of the boiler? > Home Serve is a service/maintenance company connected to National Grid which is our heating company. 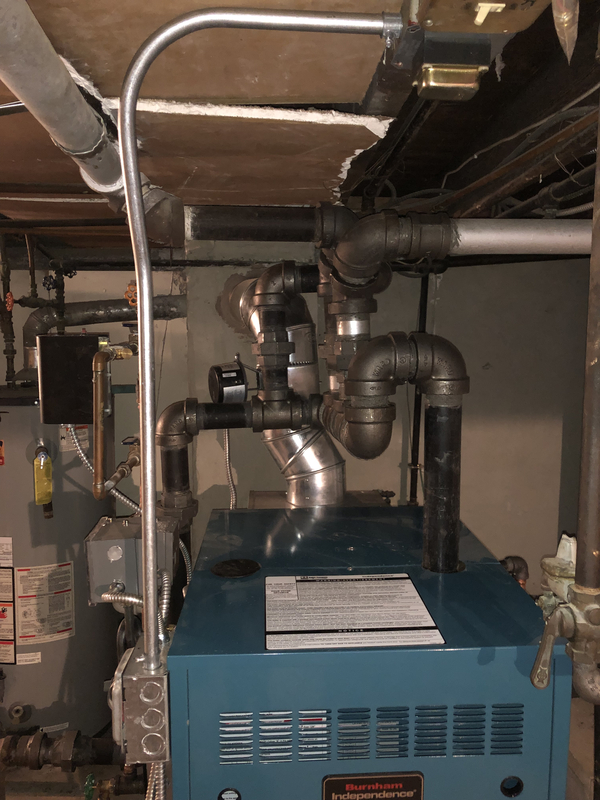 They only maintain furnaces and boilers. > I’m so frustrated because last night my mother’s radiator stopped working as well. This is real nonsense. Time to ditch Home Serve for a real boiler pro who won't put your family through such nonsense. Try the find a contractor tool available on the homepage. I'm sure you can find someone else who can assure you that the safety, reliability and efficiency of this equipment isn't an issue. > The boiler needs a good skim. Brother-in-law’s friend came and saw oil so Home Serve is coming tomorrow to flush it out and look at a part. Hopefully this will all be reaolved tomorrow. It won't be resolved if they just flush the boiler. It must be Skimmed, very slowly. 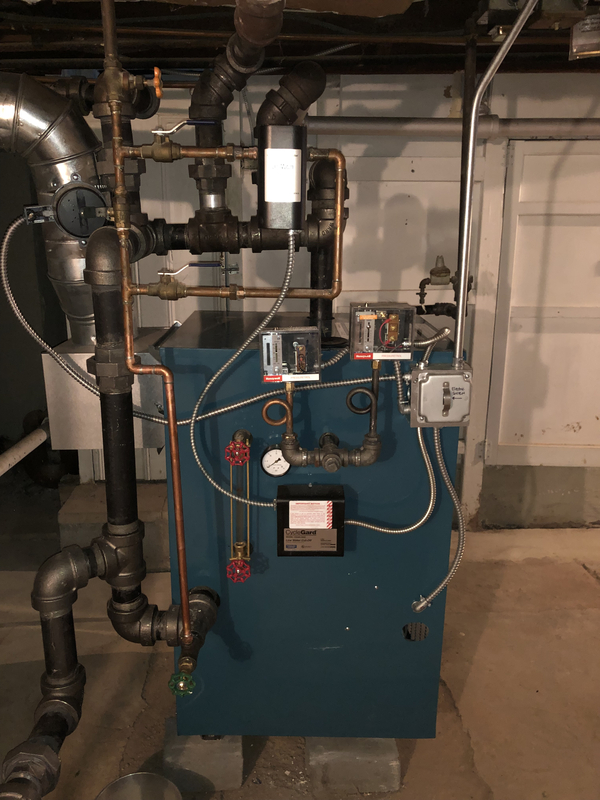 When a new boiler is drained, the oils that sit on top of the water and prevent steam bubbles from breaking through the surface of the water will just cling to the sides of the boiler. When you re-fill the boiler, the oils will float to the surface again and the problem will continue. Insist that they Skim the boiler and that they spend the time to do it correctly and that they show you how to do it yourself. It may take two or three skims to remove all the oils. It is simple but time consuming. Are the 2 problem radiators on the same main? Found out the other radiator won’t go on at 72.